It saddens me to see the new owners of property in the village move in and immediately attack the garden. Yes, they may have visited the property over a number of months, perhaps even seen it over a couple of different seasons (such are the vagaries of property purchase in the UK). However it is always a good idea to live with the garden for a year. That is not to say you can’t mow the lawn or weed any flower beds or battle the brambles. You never know where plant treasures may be hiding, yet to sprout or bud or flower, so go gently and keep your eyes peeled. Apart from not knowing what plants you have in your new garden you also need to assess the soil, get a feel of what you are dealing with, test the pH. 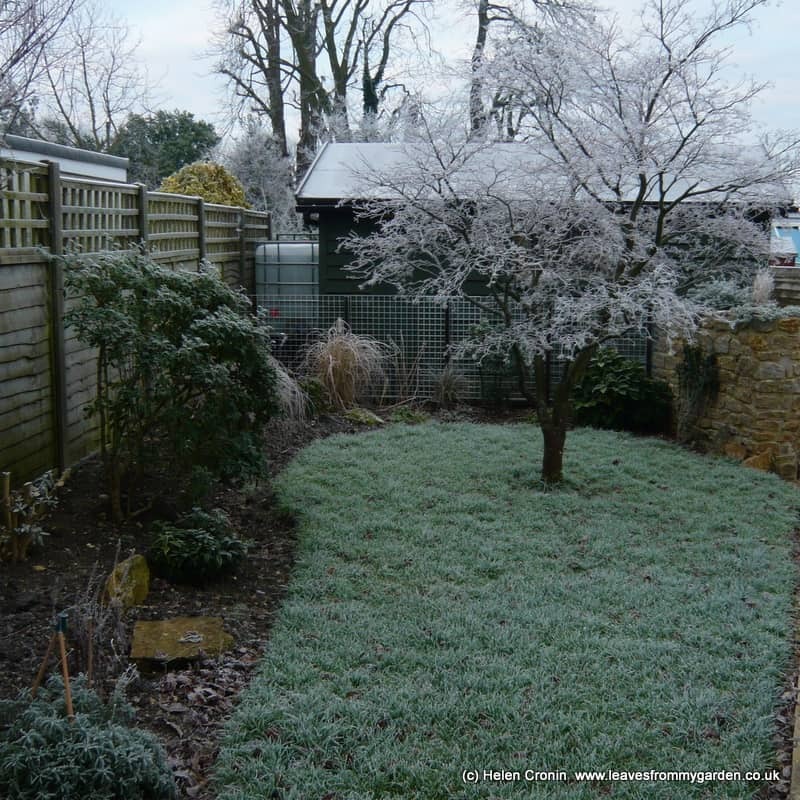 It also takes a full year to observe the effects of the prevailing wind and weather, where the garden is in full sun or shade, what benefit neighbouring trees have on the garden or not. 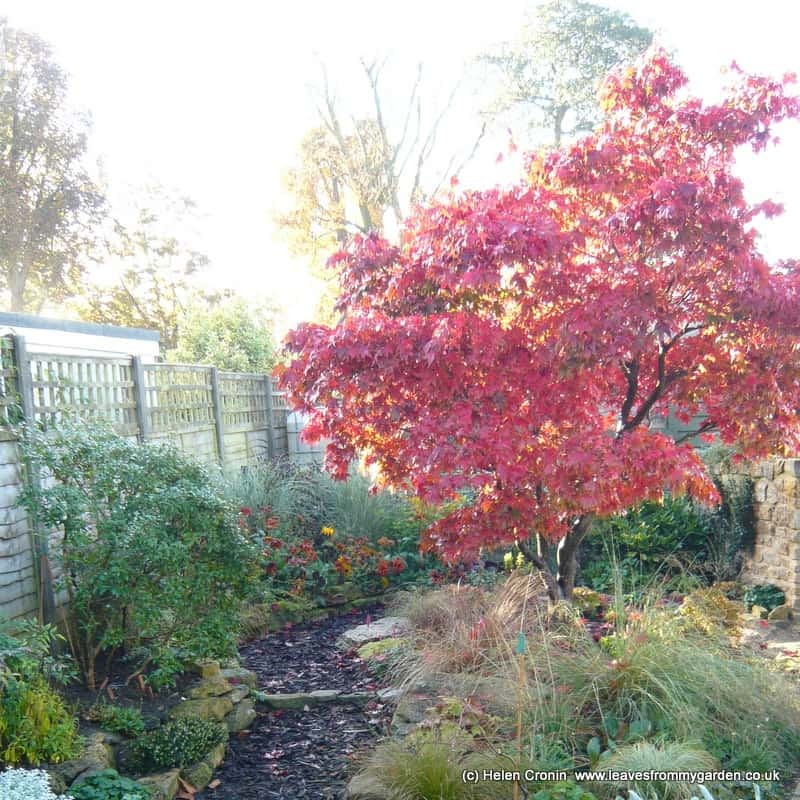 One owner was surprised to find that the Spinney adjoining his new garden was also his. His immediate reaction was to fell the lot. Apart from the loss of habitat for all sorts of beneficial creatures, the stand of trees was the shelter belt that gave protection to his garden from the prevailing South-Westerlies! When I moved to Dovewood 15 years ago there was a little Acer in the middle of a triangle of grass. The main entrance path ran down the longest side of the lawn. A narrow border ran down the other side, and a deep bed of mixed planting was across remaining side. This wider bed had the best soil in the whole garden (It eventually disappeared under the green shed as you can read here ). When I moved in, the planting of the beds included a beautiful Buddleia, a Philadelphus, Irises, Monbretia, Summer flowering Jasmine, and Roses. There were large clumps of Phlox and Michaelmas daisies, and I found a Clematis and a Japanese Quince. Having observed the garden through a full year, I had a better understanding of how the overall design of this part of the garden worked or not. I looked at it in relation to the rest of the garden, and I was able to draw up a plan for the whole area. Now, I will admit, the plan was not ambitious but it meant I could create a place of beauty and interest that fitted with my work/life commitments at that time. Families often find there is a conflict of use for a garden but there can be an acceptable compromise too. For example: very small children need to be able to play safely, so ponds are not suitable but a water feature can be a delight. Trampolines are popular with kids but not the adults who see them as an eyesore, that is, until a way is found to disguise them. Footballs are flying missiles if they share the garden with standard fuchsias or the delicate stems of prized blooms! The locating of precious plants and the football pitch can be a tad more difficult to harmonize but not impossible. And a garden swing/climbing frame/tree house can be made to please everyone. With a plan in hand and a year’s observation under my belt, I had all the information I needed to decide which plants I could keep, which I could move, and those which were beyond keeping. The Roses were very tired and unhealthy. I am not keen on prickly plants at the best of times, having had an argument between my eye and a Berberis many years ago, (resulting in a visit to A & E that I am not keen to repeat). Soil suffers from what is commonly known as Rose sickness so it is better to not to replant with new Rose plants unless you can replace the soil with some that is uncontaminated. I lifted and divided the Perennials, and this is when you really learn what you can and can’t grow. I lifted the Irises, divided and replanted them but they never grew as well. Did I plant them too deeply (the rhizome should be on top of the soil were it can be baked in the sun) or did I shade them too much with other plants or were they just too old? I pruned the Shrubs at their appropriate time – a general ‘rule of thumb’ is directly after flowering unless you want the berries or seed heads that follow. But there are exceptions eg Buddleia, I remove the spent flower heads as they finish in the Summer but they should not be hard pruned until the following year, before Spring. A local saying is not to prune until after Valentine’s Day. In other words, leaving the stems long prevents frost damage and by the 14th February when days are lengthening, it is safer to cut a Buddleia hard back. 5.Do I need a lawn? Old Tim had the bright idea to pick the brains of one Monty Don! The answer given was “In a small garden a lawn is a luxury!” For a keen gardener and/or Plants-person maximising your planting area is key. Having a lawn will not give you a vista where there isn’t room for one. Quite the opposite, it can make an area look small. But careful choice of planting can disguise the true dimensions of the plot. Our lawn had become a pain to mow…… literally. Why? Because the Acer couldn’t be happier where it is. Although slow-growing, it has doubled in height and width in the 15 years I have known it. Trying to mow around it meant ducking and diving. The dogs enjoyed racing around the tree but as they run all over everything anyway it isn’t vital to have grass (or so we thought). Old Tim’s next idea was to ask Monty if we could grow a wild -flower-meadow-type planting instead of a lawn. Thankfully Mr Don and I agreed (for once) that it was not big enough. It would look lovely for 6 weeks, look like hay until the seeds dropped and then look like a bit of mown field for too long. Messy. My solution? Prairie planting,… dreamy drifts of grasses,… with swathes of Echinacea, Salvias, Echinops……. etc etc. Stop! Wake up! Too late! I tried it! But it is too small an area to have drifts of a pleasing size. The planting looked spotty, the grasses untidy. Finally, I have hit upon not only the right balance of planting but the right choice too. The Acer garden is walked through every day, so it needs to be interesting all year. I have read that 30% evergreen planting is a good balance to aim for. Plan for colour and interest all year around. A small garden has to work hard to be successful in this but it is not impossible. In the Acer garden, the long border next to the fence is now raised and edged with natural stone. This was achieved by dropping the lawn area a bit. When I took up all the turf, I set some large pieces of stone into the ground around the tree to look as if it is growing in a stony outcrop. This links well with the wall that runs the other side of the path. There are several larger shrubs which give structure all year but generally the planting is kept low. 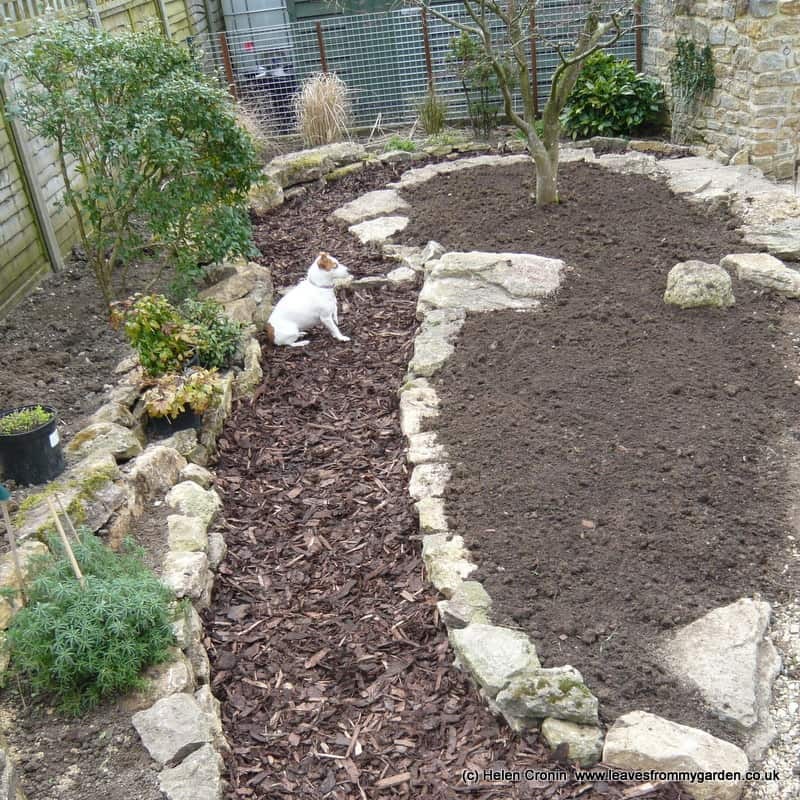 I have dressed the ground with Bark chips so that what was the lawn now blends with the path. As the low mound growing plants spread they will become a homogenous group making a far more interesting ‘lawn’, whilst tough enough to survive our dogs’ games. The Acer is underplanted with Snowdrops and Crocus, as they fade Tiarella takes over. The display finishes as the shade from the tree increases. The Winter colour through the garden is pink, purple and white. It comes from the Heathers, Bergenia, and the leaves of Heuchera and Nandina. Spring sees a delicate hint of blue from the Forget-me-nots, with yellow Cytisus and the orange-red of the Japanese Quince. In Summer the predominant colour through this little garden changes to oranges and reds from the Physocarpus foliage, Helenium flowers, and Dahlias – American Dawn and Nicholas. 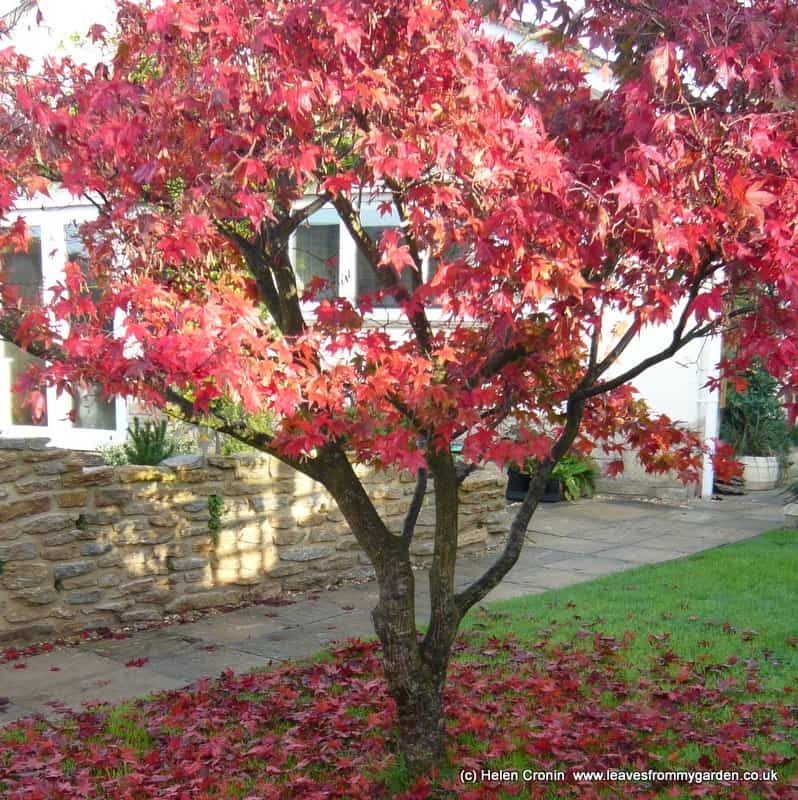 In Autumn the tree foliage turns a fiery red until the leaves finally drop. Then delicate network of branches glisten with a million droplets of rain or sparkle with hoar frost. 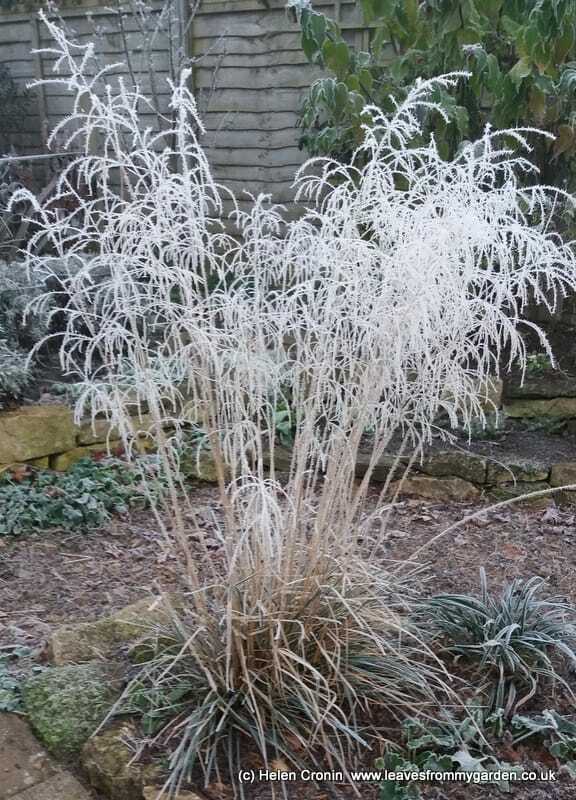 I have kept one ornamental grass in place as it makes a lovely hummock of low green foliage. The flower stems grow high above the mound of leaves but it is the seed-heads I most value. 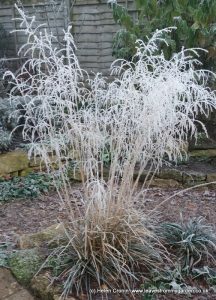 They stand stiff and erect through the winter and when touched by frost look like a fistful of Sparklers. Wonderful! A regular visitor thought I had removed a tree from this planting; such was the impact of this grass until I removed the dead stems. 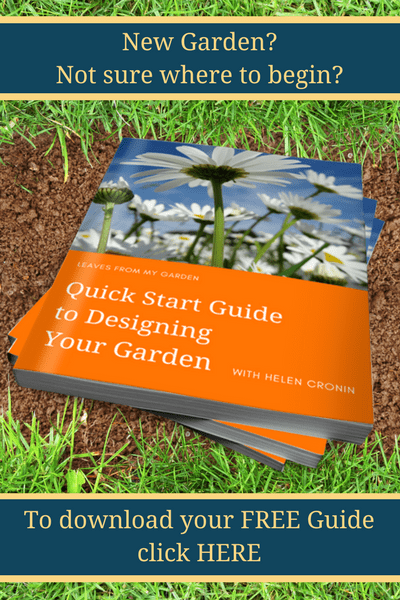 I hope that you have been able to glean some useful tips through my experience of developing a small garden. Do email me any questions you have, I would love to help you create your dream garden. « Sheds, Sheds, Glorious Garden Sheds! 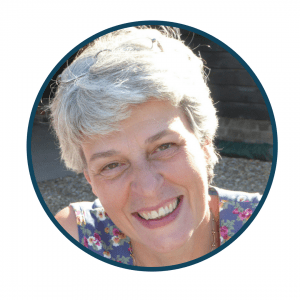 Great post Helen! I love the point you made about the garden being ever changing.